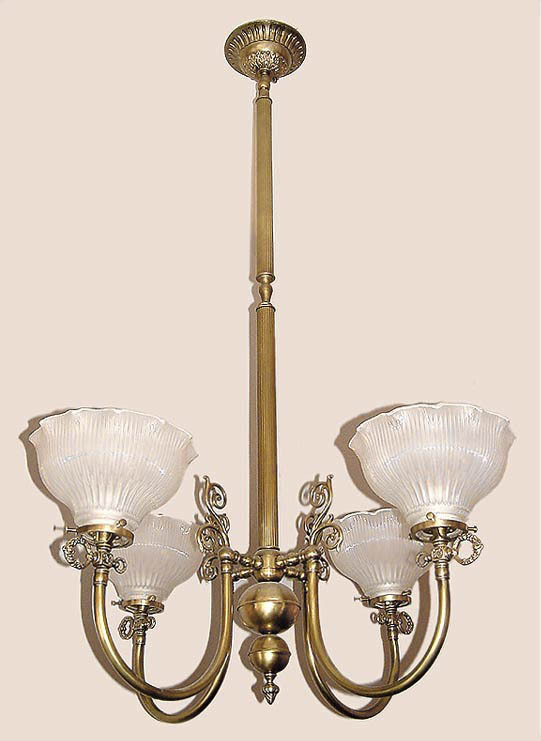 An Old English Victorian in light antique brass. Complete, with faux gas key and pie crust prismatic shades. Gorgeous heavy cast backplate shares space nicely with the reeded tubing. As with all of our ceiling lights, it includes a "hang straight" or swivel under the backplate to keep it hanging perfectly vertical, even on irregular or sloped ceilings. You can also spin the chandelier after it's hung without having to take it down and remount it. Custom height is fine, change the number of arms, metal color, whatever you like. Shown in Light Antique Brass. Available in different Metal Finishes, different Glass, Back Plate, more or fewer arms, arm direction, tubing style and many other Custom Options.